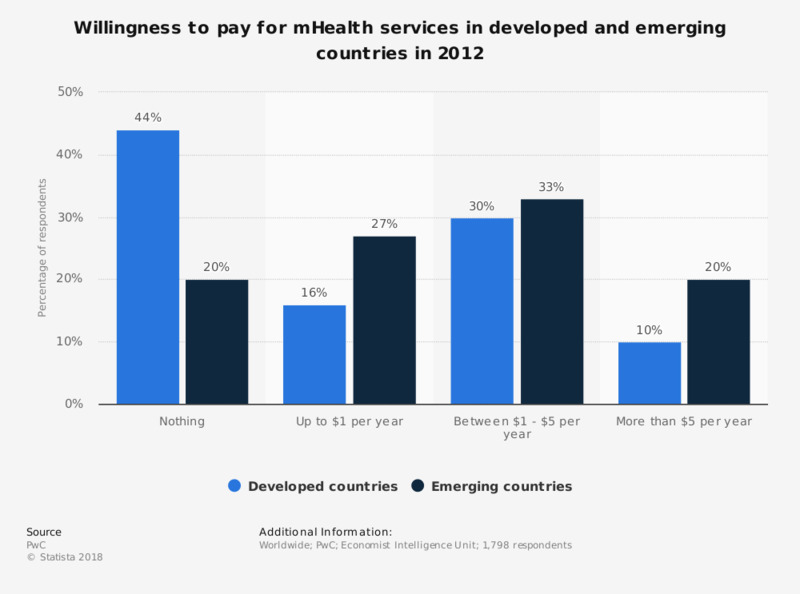 This survey represents the willingness to pay for mHealth services in developed and emerging countries in 2012. Some 20 percent of the respondents in emgering countries were willing to pay more than five U.S. dollars a year, whereas 10 percent of the repsondents of developed countries were willing to pay this amount of money. 1,798 respondents: The patient survey covered over 1,000 respondents with a broad distribution of economic backgrounds, ages, levels of education and states of health. The physicians survey with 433 physicians in the public and private sector, urban vs. rural with a wide range of experience. The survey covered also a payers survey with 345 respondents, roughly evenly devided between public and private sector and 55 percent are C-suite or above. In addition 20 in-depth interviews with key experts took place. Selected countries are: Brazil, China, Denmark, Germany, India, Spain, South Africa, Turkey, United Kingdom, United States.